You must make reservations at least 5 minutes in advance of the time at Ristorante Ciao - Naples. Parking options are plentiful for diners at Ciao. We have a parking directly behind the restaurant for approximately 20 cars. There is street parking right in front of the restaurant, a municipal parking lot across the street, as well as a 3 story parking garage on the corner of 4th Ave. S and 8th Street S. All parking is free. Looking for private dining accommodations offering Naples' finest Italian cuisine in an intimate ambiance for a celebration dinner or business function, then Ciao is just the place. Ciao has 2 private dining rooms; 1 for up to 14 guests, the other up to 36. Semi-private dining for up to 50 guests. Those who appreciate fine dining have recognized Ciao as Southwest Florida's best Italian cuisine for 25 years. Entering Ciao's recently re-modeled, elegant dining room, you know you are about to enjoy a wonderful dining experience. Chef/Owner Gianfranco invites you to enjoy traditional Italian dishes and his special creations. Appetizers include the award-winning Asparagi In Camicia and Calamari Al Parmigiano. Homemade pasta dishes include popular traditional offerings, as well as many Chef's Specials, such as Fettuccine Ciao made with fresh Maine lobster. Enjoy the best veal OssoBuco you ever tasted, as well as fresh seafood prepared in various ways. Finish your meal with one of many homemade desserts, including Tiramisu and a unique Warm Zabaglione. Ciao has a full bar and an extensive wine list, featuring some of Italy's best kept secrets. Children's menu. Private Dining Rooms available. Wonderful ambience, delicious food, and beyond fantastic chef/service!!!! We were there on Pasta Night, & really enjoyed it. I had the beef ravioli & thought it was excellent. My husband was less enamored with his sausage/pasta. He thought the lobster bisque was spectacular! Nice, relatively quiet table. Definitely go back. My husband and I enjoyed a tasty meal in a cozy environment. Our waiter was very attentive and personable. We will return! Only problem or issue was parking. Our local friends who joined us Monday evening recommended this restaurant. We had a very nice experience and definitely plan to return in the future. Party of three for a Sunday evening. Beefeater martini and Manhattan cocktails very good. Had a calimara app, good but would have liked more lemon flavor in the sauce. Entrees were. Osso buco, short ribs, and lobster risotto. All good and good portion. Dessert was chocolate cake, very dense and a little too dry for me. Only complaint is that it took too long between courses even though not full. Waitress and servers some of the best we've had anywhere. Wish they had more seafood options. I have rarely said this, we will not be returning to this Restaurant, the food missed on so many levels ! Terrific food, a little pricey. Parking was convenient, no early bird specials. Great place to come with our group of eight. They have round tables so better for conversation. It is quieter than most local restaurants which is areal treat. Service was excellent and my Veal Marsala was great. We come here quite often. Definitely recommend. Nice and quiet compared to 5th Ave dining. Service and food very good. We could not have been happier with this excellent restaurant. I particularly thank the hostess for seating us in a quiet area to accommodate my husbands hearing loss. This made the evening delightful and stress free. We have been going to Ciao since the early 90’s. Food always excellent. Have not been for a couple of years until earlier this week. Decor has changed ... and not for the better. It looks like an old ladies tea shop circa 1930. A mismosh of wall art & accessories - colors dark & drab. Our server was very nice & helpful. I had a beet salad which was tasteless & beef carpaccio which was sparse and average. Others at the table had linguine w/clams and said it was delicious. 2 desserts ordered and they were very good. I clearly ordered the wrong things! Will try again but really dislike decor. Superb in every way! Food service and ambience. Met the chef and his partner. A must go! Service was excellent. We were there for pasta night & there were many choices. Overall, we enjoyed both are dishes very much. We would definitely return as well as recommend to others. We went to the "Pasta Night" special and as always, it was excellent. Our server Natalie was there when we needed her and not there when we didn't. Great meal and great experience. I would recommend this restaurant. A fabulous meal with friends! We enjoyed the delicious italian cuisine. A very nice place to dine, just one block off the beaten path of 5th Avenue South. A hidden gem. Loved the decor old world style ! The dinners were priced fairly , my husband had the veal Parmesan and it was very tender .i had the shrimp scampi with spinach and tomato and capilliini. Very tasty seasoning was just right . We had wine and capuchino. We enjoyed the quiet atmosphere, and the mealenough to return again! efficient, polite. Food was excellent . We were reminded again of why we have always loved this restaurant. 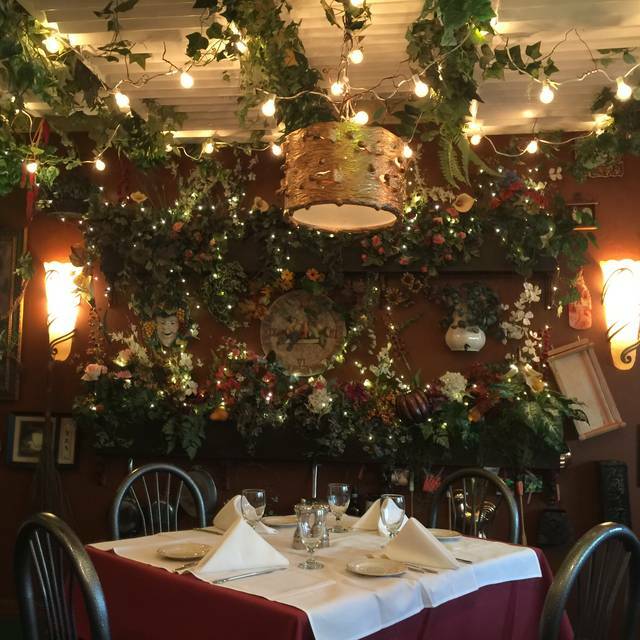 Pretty dining room, calm atmosphere, friendly wait staff, excellent food. Tonight we enjoyed a completely fabulous chilled seafood salad and steak tartare for appetizers, then had red snapper piccata for our main course. The seafood salad and the fish were both today’s additions to the menu. Everything was perfect. Terrible value for average food. Our first time at this restaurant and certainly will be our last. Cannot understand how they survive. The servers were informed and friendly, but occasionally long spaces between delivery. Gianfranco just finished an upgrade of the entire space, added a bar and it looks great. Some of the best food in Naples. Don’t miss it. Have been to Restorante Ciao on several occasions and have never had a bad meal. They are consistent. Chef Gianfranco is amazing and his wife is Carol is so professional. Staff is always on and can't believe the that anyone could complain about the staff. Simply a pleasure to have dinner there. Appetizers are always a hit and main dishes are always on track. Fish dishes to pasta dishes to veal dishes are always delicious. The deserts are great especially the Lemoncello Sorbet. OMG delicious. Don't miss this desert. Will always be back. Love Gianfranco and Carol. I thought the menu was very limited - especially for an Italian restaurant. I ordered veal parmesan - the veal was tough and the spaghetti was luke warm. Not a good restaurant for vegetarians. On a positive note, the biscotti we had for dessert were very good. Just not very interesting, food was just okay, server was very nice but too busy to properly care for our table, we wouldn't go back. Food was very good and fresh. Very enjoyable evening celebrating our anniversary. Food and staff exceptional.